Dimensions Approx: Dia: 172mm (7") Height: 195mm (7") Weight: 2.2kg This is one of our Favourite Bells. Its cast from Solid Brass and come complete with a wall bracket. The wall bracket has two methods of mounting to a wall, as shown in the pictures. Each bell has its own Quality rope Lanyard, platted for strength and visually attractive. 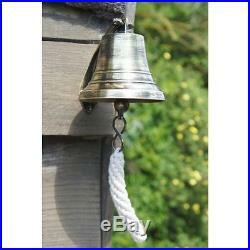 As with all brass bells they will require ongoing maintenance, especially with regards to the rope and clapper we recommend for longevity they are used with only moderate to low impact as even with limited force the sound level produce is considerable. The crown, shoulder and sound rim are manufactured from solid brass and will require no functional ongoing maintenance. Each bell is coated in a stove lacquer, so we recommend when cleaning avoiding the use of harsh chemicals or substances which may remove this protective surface and cause the brass to tarnish. The item "Extra Large 7 Solid Antique Brass Ship Hanging Bell With Rope Lanyard" is in sale since Thursday, November 12, 2015. This item is in the category "Collectables\Metalware\Brass\Bells". The seller is "black-country-metal-works" and is located in Oswestry. This item can be shipped to United Kingdom, Antigua and barbuda, Austria, Belgium, Bulgaria, Croatia, Cyprus, Czech republic, Denmark, Estonia, Finland, France, Germany, Greece, Hungary, Ireland, Italy, Latvia, Lithuania, Luxembourg, Malta, Netherlands, Poland, Portugal, Romania, Slovakia, Slovenia, Spain, Sweden, Australia, United States, Russian federation, Canada, Brazil, Japan, New Zealand, China, Israel, Hong Kong, Norway, Indonesia, Malaysia, Mexico, Singapore, South Korea, Switzerland, Taiwan, Thailand, Bangladesh, Belize, Bermuda, Bolivia, Barbados, Brunei darussalam, Cayman islands, Dominica, Ecuador, Egypt, Guernsey, Gibraltar, Guadeloupe, Grenada, French guiana, Iceland, Jersey, Jordan, Cambodia, Saint kitts and nevis, Saint lucia, Liechtenstein, Sri lanka, Macao, Monaco, Maldives, Montserrat, Martinique, Nicaragua, Oman, Pakistan, Peru, Paraguay, Reunion, Turks and caicos islands, Aruba, Saudi arabia, South africa, United arab emirates, Ukraine, Chile.